1 Apartment Aurora i Roma, Italia: Bestill nå! Beside the apartments you'll find the most prestigious deluxe hotels in Rome such as Hotel Eden, Hotel Hassler, Hotel Excelsior. 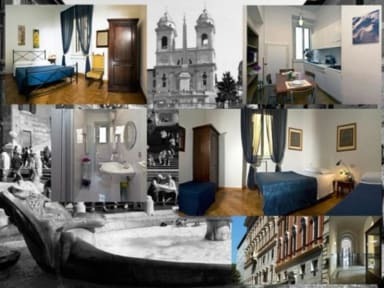 Completely renewed, the apartments are ideal for families and friends who want to spend an unforgettable holiday in the very heart of Rome. 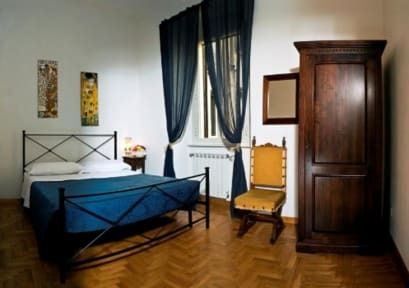 The apartments (up to 5 people) are located on the I & III floor (with lift) of an ancient XIX century building. Each apartment is composed by 2 bedrooms (one double & one triple) , fully equipped kitchen/dining room with TV/Sat (hundreds of international and national channels) and bathroom (shower, WC, bidet). Air conditioning, free wi-fi included in the apartment. Everything (gas, electricity, cleaning, linen, towels, etc.) is included in the price. There are no other additional costs. The Apartments 'Aurora' - intimate, comfortable and noiseless - offer a high standard of accommodation at competitive rates. The excellent location will allow you to easily reach several sights of great cultural and historical interest. In very few minutes walking in the heart of Rome, you will visit Spanish Steps, Piazza Navona, Pantheon, Via del Corso, Via Frattina, Via Condotti, Piazza Venezia, Trevi's Fountain, Phorum and Colosseum only to mention some of the most well known streets and monuments.